Add love and compassion to your life with plant-based cooking. Welcome to first Ordinary Vegan Podcast #2! My new labor of love. Click Here to Subscribe via Ordinary Vegan. If you are already subscribed to Ordinary Vegan's recipes, you will receive a link weekly to the most current podcast. If you have a chance, please leave me a rating and review on iTunes by clicking here. It will help the show and its ranking in iTunes immensely! I really appreciate it! **More importantly, I want you to star in my upcoming podcasts. I would love to hear your stories on how a plant-based diet changed your health. Also any testimonials about Ordinary Vegan's recipes or how we helped you achieve a vegan diet full or part-time. If you have time, tell us why you're vegan. We will also air your questions so go to town. Here is the link. Just record your message from your phone, tablet or laptop microphone. *** Here is the link to record. If you have never listened to a podcast before, here is how. Or, you can download a podcast, which means you’re saving it on your phone, tablet or computer, and you can listen to it anytime, even without an internet connection. To stream: Go to Ordinary Vegan podcast page and hit the play button. To Download: Get it delivered to your phone or tablet each week using an app. For iPhones and iPads, use the Podcasts app. You get it from the App stores and it actually comes installed on new devices just look for icon Podcasts. In the Podcasts app you search for Ordinary Vegan and hit subscribe. For Android phones and tablets, try the Sticher app. In Stitcher, search for Ordinary Vegan and click the plus sign (+), to add it to your favorites list. Now go to the Favorites list. Tell it to download new episodes by clicking the gear in the upper right corner. I personally like the a simple podcast player called Overcast. You can download it on your iPhone and listen to all your favorite podcasts. Hope that helps and now on to this week's podcast show notes. SHOW NOTES: Vegan protein is abundant in a plant-based diet! I don’t know how the vegan protein myth got started, but getting enough protein on a vegan diet is simple. Somehow we've been misled and protein became synonymous with animal products like meat and dairy. That's the brilliance of advertising. 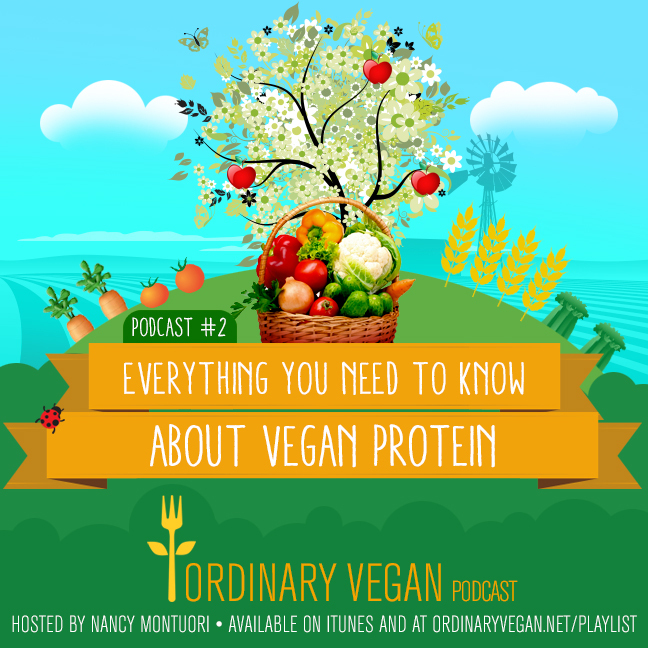 Learn all the available sources of plant-based protein on today's podcast. A full protein list is also available on Ordinary Vegan's website. Looking for a a delicious, 15-minute vegan meal for energy. Today's show features one of Ordinary Vegan's favorite recipes – Cannellini Beans, Greens and Hemp Seeds. Here is the recipe link. Hope you enjoy today's podcast episode. Our goal is to teach you how to improve your health and wellness with a plant-based diet and give you all the tools you need. Thanks for being part of our healthy community and hope you enjoy this week's vegan podcast. This website is a personal site written and edited by Nancy Montuori. This site accepts forms of cash advertising, sponsorship, paid insertions or other forms of compensation to help bring you free content.